I work with a holistic approach to healthy, beautiful skin. My clients receive advanced, therapeutic skin treatments with organic skin care products and state-of-the-art equipment that help diminish wrinkles, heal acne, reduce discoloration and calm redness. Because we are often the most critical of ourselves, especially in how we look to others, we can work together to help you have healthy, radiant skin that makes you hold your head up high with confidence. to LOVE THEMSELVES IN THE AGING PROCESS. My treatments go beyond just cleansing the skin on a superficial level. Expect real change... naturally. You can feel and look great when you get regular skin treatments and have an appropriate home care routine. I want to help you achieve the skin you desire - the skin that you show the world that is a reflection of who you are. here are some of my most popular services. Visibly firms and improves the appearance of your skin with this state-of-the-art face-lifting method. You will notice more elasticity and tone, as well as, softening of fine lines and wrinkles. 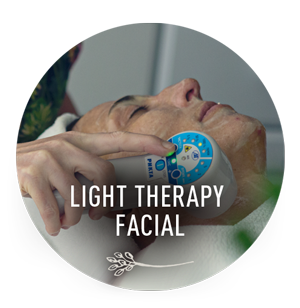 Anti-inflammatory, cool light therapy stimulates new collagen growth and increases firmness. Visibly decreases enlarged pores, acne, rosacea, hyper-pigmentation and sun damage. Improves the overall texture and appearance of your skin. The diamond-tipped wand is a safe and effective method for refining wrinkles, scars and pigmentation. themselves on their journey to glowing, radiant skin. Looking for an extra special gift for someone important in your life?